You are going to Watch One Piece Episode 412 English dubbed online free episodes with HQ / high quality. Stream Anime One Piece Episode 412 Online English dub Heartless Judgment! Margaret is Turned to Stone!! Luffy looks at Hancock’s back and notes that he saw what was on it before. Hancock tries, but fails to turn him to stone with her powers when he mistakes her Love-Love abilities for Foxy’s Slow-Slow Beam. 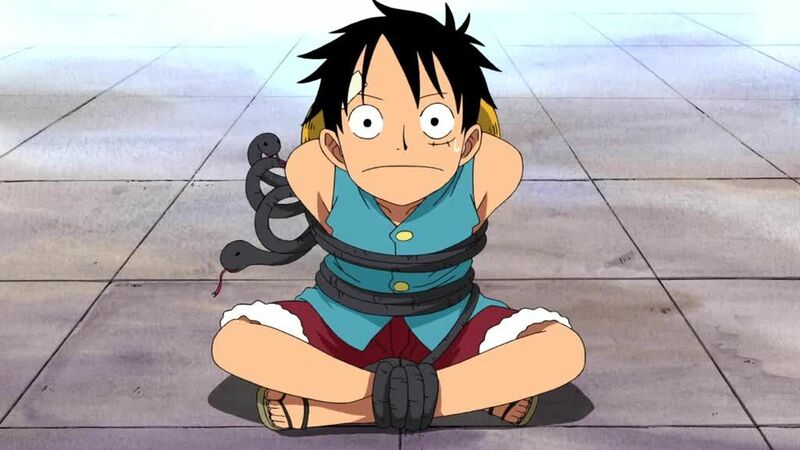 Luffy tries to escape but gets captured by the Kuja pirates and is brought to the execution arena. Margaret confesses to bringing him to the island, and Hancock turns her and two of her companions to stone. Enraged at the Kuja’s lack of empathy for Margaret, Luffy punches out Bakula, the panther sent to execute him. Hancock’s two younger sisters, Sandersonia and Marigold, jump into the arena and using their Devil Fruit powers, transform into snake-women to fight Luffy.